There aren’t many places in the world I despise or fill me with disgust. One of those places is Ko Phi Phi, Thailand. I’ve never understood the hype about it or why people like it so much. Other than being a place to buy expensive drinks, it really has no redeeming qualities. Just like Sunny Beach, Bulgaria. For some reason, Ko Phi Phi has remained “the” place to go in Thailand, much like Sunny Beach is the hot spot to visit in Bulgaria, especially if you’re Russian, English (northern English, specifically), or Scandinavian. Ten years ago, Sunny Beach was a quiet seaside town with beautiful beaches and good clubs. But as with so many other destinations in the world, as word got out about how nice it was, it got more and more popular and more and more built for tourists. It went the way of Phuket, Ko Phi Phi, and Cancun and turned into a gawdy resort town. Everyone told me Sunny Beach was a good party, but that didn’t really sell the place to me. Another beach party town? Great. I had just spent three weeks in Ios working on my tan and ouzo-drinking skills. But the people I was traveling with were heading there, so I figured I’d join them. We were all going the same route back to Sofia anyway. While the nightlife is amazing (if you like to party until 6am with drunk 18-year-olds, that is), there’s really nothing else special about this place. Absolutely nothing. I stayed three nights (two nights too long) because I ran into friends from Ios. You’re probably thinking, Come on, Matt, is it really that bad? There must be something nice about it. You’re right, there is something nice about it — it has a pretty amazing water park nearby. It’s huge, with some great water slides. I love water parks, and this is a really good one. But you can go to the water park as a day trip from Varna or Burgas and avoid Sunny Beach entirely. So why do I hate Sunny Beach so much? Look at all those chairs! This photo is from the end of the beach where there’s some sand, but if you look in the distance, you see chairs spreading out like a virus. In fact, it’s not really a beach so much as a parking lot full of chairs placed over some sand. They should rename this place Sunny Chair. Next, there’s the water. A few hours north in Varna, the water, despite being near a port, is crystal clear, beautiful, and inviting. It was just as wonderful as the water I played in in Greece. But in Sunny Beach? The water is polluted and filled with an algae bloom so large that the shoreline turned green. If you go in, you walk out looking like a swamp thing. My Bulgarian friends say this only happens “sometimes” and that the water is “usually” nice. But when I pressed them a bit more, they got vague on just how little “sometimes” was. I got the impression that sometimes might be a bit more frequent than they let on. Lastly, Sunny Beach is tacky tourism central. It’s full of glowing neon lights, bars, people on the street trying to get you into their restaurants or clubs, fast food chains, cheesy t-shirt vendors, and everything else a built-for-tourists destination has. If you’d blindfolded me, drugged me, and woken me up in Sunny Beach, I could have easily said I was in Kuta Beach, Phuket, Cancun, a bad Florida beach town, or any number of cookie-cutter beachy places in the world. There’s no culture or uniqueness to this place, except that some signs are in Bulgarian. 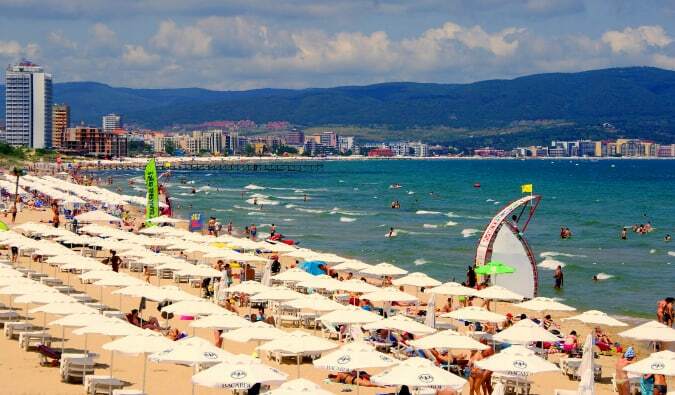 Finally, Sunny Beach is filled with people who just want to overpay for a week of drinking. It’s always happy hour, there are always free shots, and huge night clubs go until dawn. I felt like I was on spring break. But if you really want to go on a binge on the cheap, there are tons of better destinations in Europe: Barcelona, Lagos, Ios, Dubrovnik, Varna, and Constanj, just to name six. Those places at least have some history, culture, and charm to them. In sum, Sunny Beach is a giant tourist trap of a destination with a bad beach, overpriced food, tacky bars and souvenir shops, and a bunch of drunks. If that sounds like fun to you, I highly recommend it. But there are better places to party than Sunny Beach. (I know, I’ve partied in them). While I love great nightlife, I’d rather party in a place that also actually has a nice beach. If I never see Sunny Beach again, I’ll be the world’s happiest man. Find a cheap flight to Bulgaria by using Skyscanner or Momondo. They are my two favorite search engines. Start with Momondo. Want More Information on Bulgaria? Be sure to visit our robust destination guide on Bulgaria for even more planning tips! I hate those beaches like at the photo! Much better to be at a small hidden beach on your own! I so agree with you bout Phi Phi island… Before our trip last Dec it was this utopic beach destination!! But little did we know that most of the images of this place on the internet are quite misleading. The moment you reach, the place looks like a tsunami of country made boats, Yachts and various diesel guzzling vessels!! Ones on the pier you are breathing in half combusted diesel fumes. Well, then you are greeted with a sea of backpackers, tourists, travelers, hippies… Expensive Booze… Very touristy. And I was with my 3 yr old daughter and she kept bumping into bare chested 300 pounders!! A let down. Next time in Phuket … Avoid Phi Phi island! Thanks for the warning. I don’t like beach towns like this either? I was looking forward to this article ever since you had mentioned on Facebook that you were in Sunny Beach. I went there in 1998, and I have to say “Ten years ago, it was a quiet seaside town with beautiful beaches and good clubs.” —> No. In 1998, it was already exactly the way you describe it in the post. Hotels: Old concrete blocks, guests: mainly drunk old Russians, beach: filthy and crowded, flair: non-existent. While I have never been there, I would have to agree based on what you shared – this is the type of place I would despise as well. An overcrowded, touristy beach with nothing but partying? No thanks – I’ll pass. There are thousands of other beaches and places in the world that seem like a much better place to visit (many of those probably in Bulgaria). With that said, I am a huge fan of Bulgaria. Would love to visit and experience the culture there. I’ve met a few Bulgarians here in the US and have really enjoyed the culture. add Mancora, Peru to the list…. Sunny Beach ranks near the bottom of places I would return to as well. I remember my old LP guide book saying you can never check out of the Hotel California in Sunny Beach. So true – loud music day and night! Just a short ferry ride across the water is Nessebar, though, which is very pretty and interesting. I am sure glad I was there after things closed down for the season. Didn’t like the look of the place even when it was quiet. Nessebar was more attractive and something to do. OMG. Nightmare! We HATE this kind of place! Maybe it’s growing up in Canada with lots of personal space, or just having traveled enough to know you can be nearly alone if not completely so on so many beautiful beaches in this world! Thanks for the heads up – we’ll cross this off any list for the future! Wow, that beach photo looks terrible. I’ll be a happy camper if I never make it to Sunny Beach bulgaria as well. I am bulgarian and would never ever go to Sunny beach myself, on the other hand there are so many beautiful places one can visit in Bulgaria, unique places like Saint Toma , Kaliakra or Rawda and a lot of other places on the beach , monastery or mountains or Sandaski with its unique climate and many , many others. Sunny beach is the top of the human stupidity / overbuild in the last 10-15 years/, spoiled nature / I used to like it before/ and I am really angry now with what they have done with nature of my own country there!!! me and my husband are going to bulgera in may with are daugther we are going to dunni resort but my mum and here friend are going to sunny beach at the same time and there in there 70ts and 80ts could any one tell me what is like in may and what is the difrents between sunny beach and dunni resort please. as it the first time to bulgera thank to any one who can reply. Hi, well in May it can be even nice, I mean I have been in June (I think) and it was quite ok. Most of the drinking and party folks go in July- August. In May there will be mostly German middle age tourists :). So it should be quiet. I just heard the other day they have some problems there with the plumbing of the resort, but if it is not rainy it shouldn´t be a problem. I´m from Bulgaria and it is really sad to see what happens there in full season. About the blooming of the algue, well there is no wastewater treatment plant there, so only brave/ with strong immune system persons should enter the water in august :/. Very well written. I agree with you on Sunny Beach. And for one other reason: people who visit it don’t know how to drink and get way too wasted. A tourist girl puked on my leg on my way out of a club…. Busy beaches are definitely a joy kill. I think everyone wants to hear the relaxing sounds of waves and be able to walk around the sand without stumbling over people. I totally agree with you and exactly the reasons why I skipped the Gold Coast in Australia. I didn’t care who was stopping, I looked at who they were (mainly British and other European sorts who never see beaches like this) and ages (all under 25) and said no thanks! More days in Cairns (a party town, but easily avoidable) and Noosa were more my speed. Definitely looks like one worth skipping. Best part of this post: your water park loving confession. I know what you’re saying, there’s nothing worse than visiting a quaint little place that you fall in love with only to re-visit a few years later and find the complete opposite. I bet those locals aren’t complaining though as they sit in their new villa counting the pennies. In that picture and from your description, the place looks tacky, cheap, over-run with tourists and way too commercialised. Just look in the background of the picture nad you see these high-rise hotel buildings. Mass tourism. I’ll stick to my small beaches in Mauritius. You hit the nail on the head, Henri! I remember going to Sunny Beach as a kid, on day trips from my father’s home town which is 35 miles away inland. Back then – in the late ‘80s – it was an overpriced, socialist, hard-currency extraction trap, with the redeeming quality of a wide 4-mile-long swathe of fine pale-gold sand. I also remember the bay being relatively kid-friendly, because you could go in quite far before it actually got deep. Oh, and one more thing – it had the first-ever bowling alley and game arcade I saw in Bulgaria, communist Bulgaria, that is. With the rise of low-cost airlines and Bulgaria’s entrance in the EU, the steady stream of young northern Europeans looking for “cheap” booze and all-inclusive binge-drinking holidays has certainly contributed to the deteriorating vibe at Sunny Beach, making it feel more like Bali’s Kuta, or Yucatan’s Cancun. I’ve been through both, and unimpressed have moved on to less tacky beaches in the respective places. Same holds true for Sunny Beach – you ought to get out and explore: the rich 2500-year history of UNESCO-listed Nessebar beckons, literally at the south end of the Sunny Beach bay, as do the crystal-clear, emerald green waters of the north coast, beyond cape Kaliakra, or alternatively, the small, quiet towns that dot the Bulgarian shore further south: starting with Sozopol, Ahtopol, Tzarevo, to the confluence of the Veleka River at Sinemoretz, which is designated a natural preserve, and last time I checked had no beach chairs, except for the occasional fisherman squatting on a stool. Happy trails in Bulgaria and beyond! I have heard good things about Sozopol and would like to go back there when I return to Bulgaria! The Long Beach is the only nice part of Phi Phi and it isn’t even that nice, which says a lot about how bad the island is. but what on earth are you talking about the beach for ? Sunny beach have the most activities Ive ever seen on a beach and in addition to that is gorgous (the picture you show does in no way shape or form do the beach justice the sand is MUCH more yellow than on that picture). The atmosphere is great when you go during the evening. And I find it boring as hell to be on a desert beach I prefer tourist beaches because there are so much going on. Being on a beach alone is empty and meaningless for me. So for me its the other way around: Visit Sunny beach for the beach only and avoid the rest as much as you can(all inclusive anyone??) If you want the whole package go to Mallorca Alcudia or Can Picafort there you will find everything you would want in a holiday. Actually I wanted to read about Barcelona, but just somehow got stuck reading this one…To be honest, this is the first time that I read your blog and don’t really agree with you! 🙂 What you say about Ko Phi Phi and the same about Bulgaria, and I do know what you mean and agree with some of it, but I think that a lot of people love the island already just because of the people who they meet there. A lot of backpackers in South Thailand travel the same route, start in Phuket, go over to Phi Phi, Krabi and then full moon party in Koh Phangan. And it is actually a lot of fun to go to full moon party with 20 other people who all just somehow got stuck with all this partying in Ko Phi Phi. It’s more like the lifestyle there that everybody loves, not just tourists but also people who work there as diving instructors or bartenders(although they once were probably tourists too:). One thing is to go to a quiet beach and enjoy just the ocean, silence and the beach. The other thing is to go to a beach that might be over crowded, have totally overpriced and tacky bars/pubs around it, but to have the best party with amazing people, who all actually love that quiet beach version more but for some reason chose to spend their time in one of those tourist traps. Like some of your other posts say – it’s mostly all about the people you meet along the way. And I’m not talking about myself here because I spent 2 days on Phi Phi, doing other things like scubadiving and going to bed at 9PM. 😛 But I went to Phuket like this, prepared that Pa Tong beach is gonna be sleezy, over crowded and that I would just use the place as a place where to land in Thailand, but I met some awesome people there and for a second thought that “you can’t live like this forever but why not for a little while..”. And all it actually was – I was part of all these drunken young people who did stupid things and found it the best time they’ve ever had. 🙂 Although I had never heard much good about Phuket, it was the best time during my 2,5 years long travels. And these people are not all 18 years old and first time abroad, getting drunk. Everybody has different exciting backgrounds and that’s what makes traveling the most exciting. Omg, i know myself too well to know that overcrowded touristy places full of drunk, noisy youngsters are so not my style (I’m not an old fag either- I just prefer far less hyped, easier going surroundings for my own sanity). I went to Cancun this year on a family trip. Coming from Costa Rica, while I am able to appreciate the differences between countries, I wasn’t really that impressed… And certainly not the kind of destination I’d choose if I were backpacking on my own. Not that I’m even remotely close to visit Bulgaria at this time anyway – but it’s always good to know. I went to Sunny Beach when I was 17. It was the best time a young guy could have. We were buying trays of drinks, I don’t know how much but it was LOADS, and it was literally less than $10. The clubs were absolutely amazing. I went again about 5 years ago and the place has been destroyed. It really was a special gem before it became mainstream. Sad. I am Bulgarian and I agree about Sunny Beach. Definitely not the place to be. We love our summer resorts, but places like Sunny Beach and Golden Sands we prefer to leave to groups of drunken teenagers from abroad. Of course, we feel bad for the rest of the tourists, who want to actually see some of our culture and nice places, and have genuinely good time, but end up there. Sunny Beach was the first place we visited in Bulgaria and we actually quite enjoyed it. Since though, its been getting worse and worse each year we go. However, it did allow us to find Sveti Vlas (we’ve since bought an apartment there), which is just 5 mins ride or 30ish minutes walk away. We love it there, much smaller and more exclusive. Has a fair few tourists looking for a bit of sun but still has a lot of locals living there so you get the best of both sides. If you do find yourself stuck at Sunny Beach, i’d really recommend checking it out. Also we really love Nessebar, even though it gets very busy in the tourist season, it is such a beautiful little town with some really great food. I stayed 1 night in Sunny Beach in July 2015. That was enough. Thoroughly recommend Sozopol where I stayed for a week and Nessebar for 2 weeks as base to visit other towns. When I first visited Phuket in 1980, Patong was one dusty road with no bars, generator lights would go off at 10pm, fisherman cooked their catch on the side of the road. You sit on stools made from coconut tree trunks. The water was crystal clear. There was only 1 hotel at Kata Beach. Phuket has degenerated so much.Unfortunately, it has happened to most of Thailand. Progress!! My preference now are the Greek islands in spring and autumn where I hop around on my bicycle. I was in Sunny Beach and I loved it although I hate partying (most of the time). We stayed a bit off the center where it really is dreadful, but where we stayed it was alright, a regular hotel. The beach was a bit crowded, but not like in the picture you showed. There were beautiful dunes and lots of space for a towel. And the water was amazing! And to say there is no culture in Sunny Beach: true, Sunny Beach itself literally has no culture. But Nesebar, which is really just a hop away, is the ultimate culture boost! One of the oldest towns in Europe. I agree that there are better places to stay in Bulgaria than Sunny Beach but it doesn’t have to be AS bad as you described. 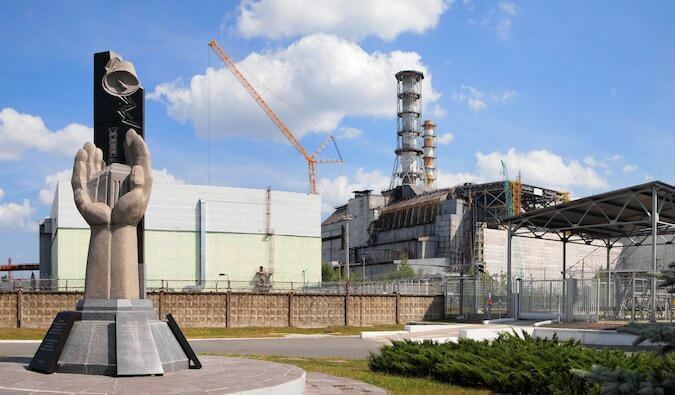 Oh This Article is far too kind for Sunny Beach….This place has destroyed the local nature, this place is a touristic abomination…they have ignored all the lows of Sustainable tourism development, and I can’t imagine how crowded it must be in August. No wonder this resort doesn’t create repeaters. By I don’t share your opinion about Ko Phi Phi. We went there during low season and it was rather quiet and relaxed. We didn’t have to overpay for our drinks either and the locals were really friendly. So my guess is that high season is horrible, but low season still contains some of the old charm. I am surprised to hear that your friends were actually trying to defend Sunny Beach – Bulgarians mostly hate it with a passion and use every chance to say just how bad they find it. There are some much more charming locations in Bulgaria with beautiful smaller beaches where you can’t find a single chair even if you wanted to. 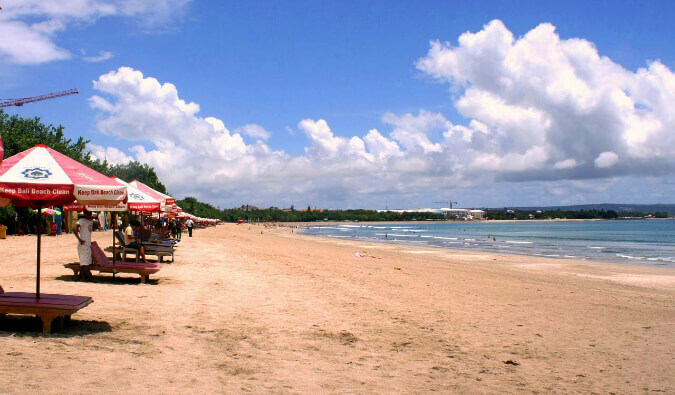 A prime example is Bolata beach. Sadly enough, most people don’t have a clue that the north part of the Black sea (Varna and above) is times and times more appealing than the southern. When/if you visit Bulgaria again, do check it out. I strongly recommend Yailata (archeological reserve on the rocks with stunning scenery), Bolata beach, Zelenka beach and some smaller ones near the Golden sands but you’ll get best advice from the locals while there. P.S. Also – if you visit the country again please drop us a line – we’d gladly offer you a complimentary rental car to explore its beauty. I am from Bulgaria and I can agree with the written above and all the comments after. Sunny Beach is overrated. I am sick of people always telling me let’s go to Sunny Beach and get wasted. Come on I am going on a vacation and I want to relax and see some beautiful scenery. The smaller towns and resorts are the go for Bulgaria as they are cleaner and have a more relaxing atmosphere. Pomorie, Obzor, Primorsko are my choices when i go on a vacation at the sea. Hey Matt, I want to share a Bulgaria destination with you since I am not sure if you have visited it. Just type in Google “Pirin koncheto”, people say that they come back a different person once they climb peak and it’s really beautiful. You can even take some nice pictures there.